Cooking is always a challenging moment for me and my Little Angels as we explored the new style of cooking. As a Mom to my 5 Little Angels, I always ensure my Little Angels got the best taste of food that are healthy and delicious too. This round, our mission is to create an inspiring, delicious dish or combination of dishes using the premium quality New Zealand products given to us. Let me share to all of you, 2 of my master pieces of dishes using 2 hero ingredients in my mystery bag. 1. Heat the pan and melt the butter. 2. Add on the minced garlic, big shallot, curry leaves and fresh chili. 4. Add on the Oat to made the sauce ticker. (Some use corn flour but I prefer Oat because it is healthier for my Little Angels to stay healthy). 5. Take out the Talley's New Zealand Greenshell Mussels from the pan and arrange it at a plate. 6. Put some cheese on top and baked it for 10 minutes until the cheese melt. 7. Spread some basil leaves on top of the mussels once it is removed from the microwave before serve to everyone. 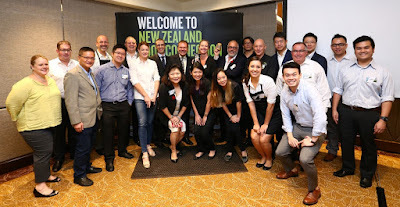 King Salmon, Arahi Halal Wine and Pic's Peanut Butter alongside a range of safe and tasty new produce for Malaysian consumers are amongst the latest offerings from New Zealand and unveiled at Food Connection Malaysia. Chef Sam Kung, Executive Chef of international luxury hotel InterContinentail Kuala Lumpur was on hand to show how these ingredients can come together in a wide range of delicious local and international cuisine. "Every day, more than 2,600 food producers create mouthwatering and nutritious foods to suit every palate in Asia, all in safe, sustainable and pristine conditions," says Matt Ritchie, New Zealand Trade Commissioner to Malaysia. "We are honoured to work with likeminded partners here in Malaysia and look forward to bringing more delicious and high-quality New Zealand food to Malaysian consumers,: said HE Dr John Subritzku, New Zealand Ambassador/High Commissioner to Malaysia. New Zealand export more than half its total food production and Malaysia is the 9th largest export market. 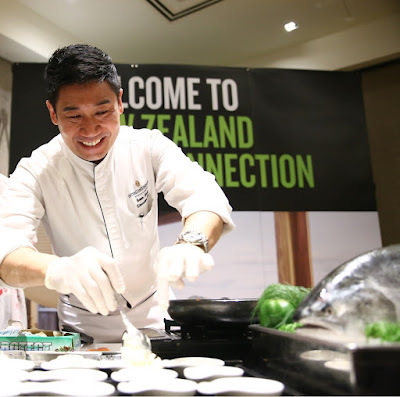 The showcase at Food Connection Malaysia is a demonstration of New Zealand's understanding of the complex international food market and rapidly growing need to produce safe and quality food in a sustainable and innovative manner. Relish some of New Zealand's best F&B products and meet the companies all without travelling to New Zealand. Check out for New Zealand produce in supermarkets or visit www.newzealand.com to find out more. Also featured were the best in meat, seafood, beverage and grocery items from the likers of Dunningham, Eco Healthy Foods, Emerald Foods Ltd, Fonterra Brands, Giesen Wines, Kapiti Ice Cream, Mudhouse, New Zealand Unlimited Sdn Bhd, Pure South, Sealord, Shott Beverages, Spring Sheep Milk Co. Talley's, The New Zealand Dessert Company and The Tatua Co-operative Dairy Company. 3. Add on the Marinated Hake Steak and fry for 4-5 minutes and turn the fish and cook it for another 4 minutes on the other side. 4. Remove the fish from the pan to a serving dish. Within half an hour, Mommy Jane had accomplished 2 master pieces using the 2 Hero Ingredients from New Zealand Food Connection i.e. New Zealand Greenshell Mussels and New Zeland Bonfiskey Deli Premium Seafood of Hake Steak. There were named as Cheesy Greenshell Mussels with Butter Sauce and Pan Fried Hake with Basil Leaves. My Little Angels love the new creations very much because the items given were fresh and juicy. It is indeed the best seafood ingredients from New Zealand. With Western and Malaysian style of fine dining experience, all of you should try out my secret recipe here using 2 hero ingredients from New Zealand. Droolworthy! I liked the way you have used these ingredients. OMG The food you have cook with new zealand food looks so yummy =D Wish to try to cook it too! Sharon, the seafood is very fresh and mades the dish yummy. Good luck on your cooking. Easy and healthy dish. The salmon look fresh. This week will go for grocery and will buy this fresh seafood from New Zealand. Love the produce from New Zealand! You look quite like a master in the kitchen! You are cool mummy!!! I like the food from New Zealand!! Fadzillah, you should get it now and try my recipes. I'm sure you will love the taste. I am drooling over mussels looking simply yummy. Pooja, lets try the cooking with my recipes. I'm sure your children will love it so much. not a fan of mussel but a fan of salmon. The way of preparation looks very delicious! Thanks for sharing. Geng Qian, you should try to cook the Greenshell Mussels using my recipes and I'm sure you will love it coz' before that, I'm not a fan also but once I explore my new recipe, I love it so much. Rane, it is indeed fresh even though it is from New Zealand. nice leh!!! I need to try it at home too. Berry, thanks for the compliment. Next time when you feel hungry, you can try out my recipe here using hero ingredient from New Zealand. The mussels looks so delicious, I wish to try it.